The Centurion slot machine is one of the most popular slots in William Hill and Betfred bookies, with a great range of features and a large, often generous amount of bonus hidden features. The bookies jackpots for the Centurion slot machine are the standard £500, however you can play Centurion online with jackpots far exceeding the £500 limit, often running into tens of thousands, even on low stakes. Like the vast majority of slots, the Centurion slot machine is a far better game online, however the bookies slot is still very enjoyable. The gameplay is mostly the same both online and in the bookies, however the bookies does have one additional feature that is rare in online casinos; the bonus gamble. Not everyone’s choice, but the option is there nonetheless to gamble your winnings up to the maximum of £500. The payout percentage (RTP) is significantly higher online, this is mainly due to lower overheads with RTP’s around 96% on all stakes. The betting terminal stakes vary depending on the stake you are playing; 20p pays 88%, 50p pays 90%, £1 pays 90% and £2 pays 92% long-term. The £2 stake also awards double sized bonus symbols which you do not get online. Once you have chosen your stake, press start to spin the colourful, Roman themed reels. There are twenty winlines, each paying for three or more matching symbols, there are also multiple wilds to help complete and add to wins. Any wins in the bookies version can be gambled using the gamble button at the base of the screen to select your options. The gamble is optional and pays out at 100% long-term. Upon entering the Centurion slot machine gamble screen, you’ll be greeted by a disk of yellow and black, the odds can be changed to increase or decrease the amount of black. Press start to gamble, with the arrow landing in one of the two colours; yellow is a win, black is a lose. Any winnings can be part-collected prior to pressing he gamble, with all wins gambled up to a maximum of £500. The gamble pays true odds, with the odds you see the odds you get, this makes the gamble very fair and long-term it returns at least 100%. Centurion has both random features during the reel spins, and standard slot machine feature awarded when three or more bonus symbols land in view. The random features appear frequently, however they do not always pay a prize. The random features can award a cash prize, a bonus extra-large reel for the chance of lots of wins across all twenty winlines, and the chance of a feature entry with extra bonus reels. These random features are triggered every time a Roman trumpet player appears from behind a bush, however sometimes he rustles but doesn’t appear. The concept is similar to Genie Jackpots, which again is also available online. The main features are awarded when three, four or five bonus symbols land anywhere in view. Once active, a large bonus wheel appears which you must rotate. Each section of the bonus wheel contains a feature, with some more common than others. When the wheel comes to a halt, the corresponding feature will be awarded. Prizes on Parade: Win cash prizes by pressing stop, and advance to the next level by landing on an arrow. The feature ends when you stop on a prize with collect written underneath. All prizes are accumulative, and totalled up at the end of the feature. Road to Rome: Move around the board by rolling the dice and collecting cash prizes. You only have a limited number of dice rolls, however more can be collected during the game. Reach the end of the board to enter the big money. The big money awards one of multiple large value cash prizes, up to the jackpot (depending on your stake). All wins accumulate and are paid at the end of the feature. Caesars Free Spins: At the start of the feature you must spin two wheels, one with the amount of free spins, the other with a multiplier. It is possible to have twenty free spins on a 10x multiplier, although you are more likely to be awarded something in-between. The free spins are played out on the standard reels, along the twenty winlines. All wins are multiplied accordingly at the conclusion of each spin. The feature ends when all spins have been exhausted. This bonus is different to the latest Centurion Free Spins slot, which has super stacked reels. 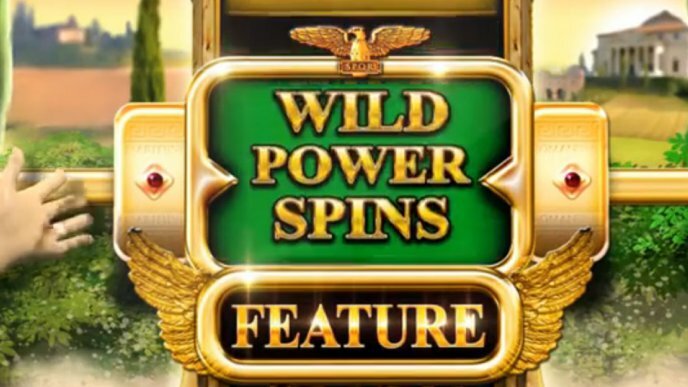 Wild Power Spins: This is often the most generous Centurion slot machine feature, and as such is the rarest. Three Wild Power Spins are awarded, the first places a block of wilds on reel two, the second places a block of wilds on reels two and three, and the third places a block of wilds on reels two, three and four. The wins are usually massive on this feature, especially on the last spin. The Centurion slot machine is one of the most popular slots both online and in the bookies. Its generous features and fun gameplay make it a popular choice for many players, with a wide range of stakes and large jackpot prizes. I still really enjoy this slot even though is getting pretty old now. It also has a lot more fans than the later Free Spins version, both of which are in the bookies at Betfred and William Hill. I started this gambling session with £100 but was unable to record straight away, so the video joins me at the start of the Power Spins bonus. Power Spins is probably the best bonus, and with £50 Fortune Spins, all wins are multiplied by x5, pretty much ensuring a £500 jackpot. This bonus didn’t disappoint, boosting my balance to £550. The way Centurion Fortune Spins plays is very similar to Genie Jackpots, both of which use a large wheel to pay either a bonus or a set amount of Fortune Spins from two to ten. The difference is the player can now spin the wheel (either up or down). The harder the spin, the longer and faster the wheel spins for for paying the outcome. A while later I hit the Rolling Reels bonus, another of the highest paying games, so a fantastic and rare run of luck. This bonus lines up all of the reels then spins them off until the come to a stop. On £50 stake, any full screen pays the jackpot, and most other wins pay the jackpot or very close to it. This spin brought in 7 five of a kind wins, which after the x5 multiplier paid £500. My next bonus was Road to Rome. This one is fun but can sometimes pay terrible. It does have good potential, with the end of the road paying a big money bonus game. The bonus is basically a board game with a set amount of spins to help you progressive forward, collecting cash on the way. Road to Rome started with five rolls of the dice, and progressed me forward enough to bank £88, combined with a x5 bonus resulting in a win of £440. I played several more £50 games and eventually collected a very good profit of £1135 (£1235 collected). As it happened, this session on the Centurion slot was my best ever, and I’ve never actually being able to achieve such a successful run of high paying bonuses. When you play online the Fortune Spins option isn’t available, it’s only available on fixed odds betting terminal stakes of £20 to £50. Surprisingly, the Rolling Reels bonus also isn’t on the online versions, nor is it on the standard Centurion slot game of 20p to £2 stake.